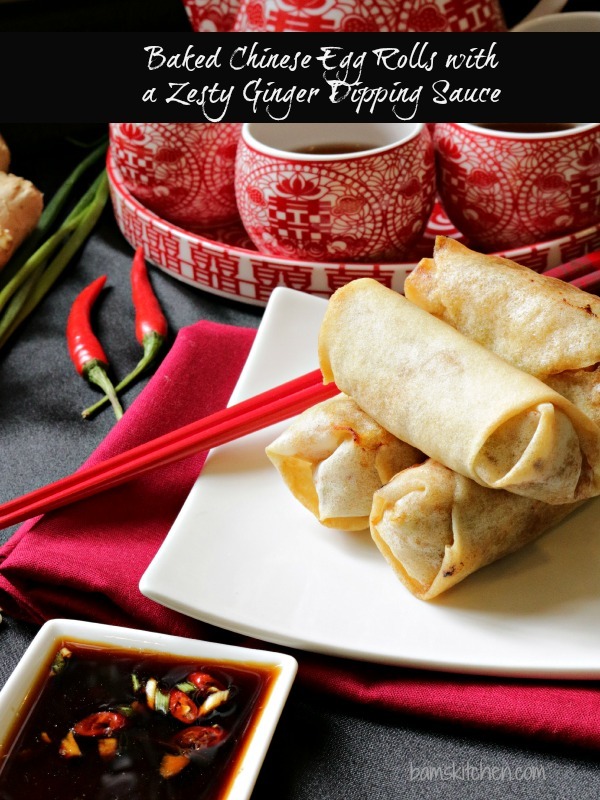 Crispy and light spring roll wrappers filled with tender shrimp, pork, ginger, garlic, fresh herbs and spices and baked to perfection with a zesty ginger tamari dipping sauce. Chinese New Year (CNY) is right around the corner with the celebrations from Feb 19-22, 2015 . 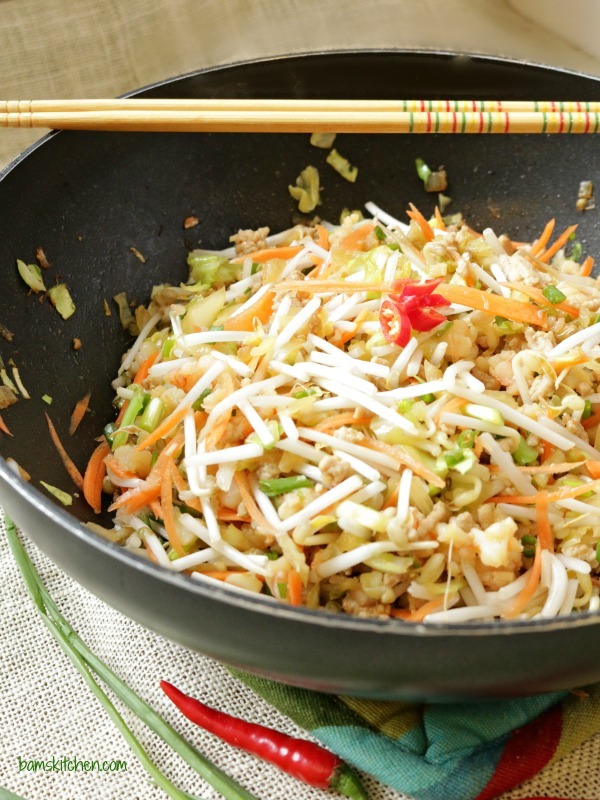 Bam's Kitchen will be working right along with you to help you get prepared for the new year with some delicious Chinese recipes to share with family and friends. My husband told me it was impossible to have a delicious spring roll that was not fried. Well, that was just enough fuel to antagonize me and increase my desire to prove him wrong. We all enjoy fried foods everyone once in a while but right after you eat them you have guilt. You quickly forget how good it was for those few seconds of deep-fried pleasure when you start to feel sluggish, greasy all over, and not to mention the HUGE mess in the kitchen to clean the grease off of the stove. My baked Chinese spring rolls were just the opposite. Baked Chinese spring rolls are light and crispy on the outside and tender and delicious on the inside, without all of the grease. There is no greasy taste, no greasy feel and no greasy stove top to clean off. 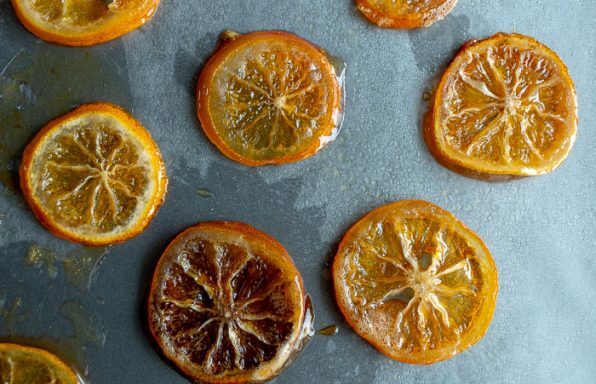 From a dietary perspective, just imagine all the calories you can save from baking instead of deep-frying. 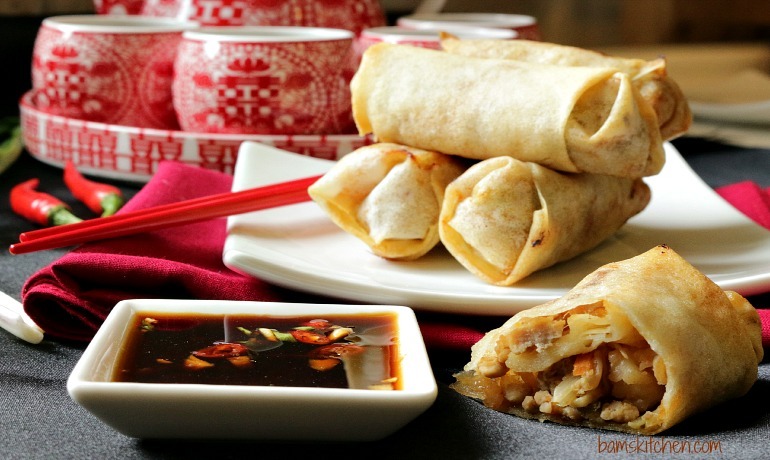 Baked spring rolls do not get as golden brown as fried spring rolls but they are very crispy and delicious. 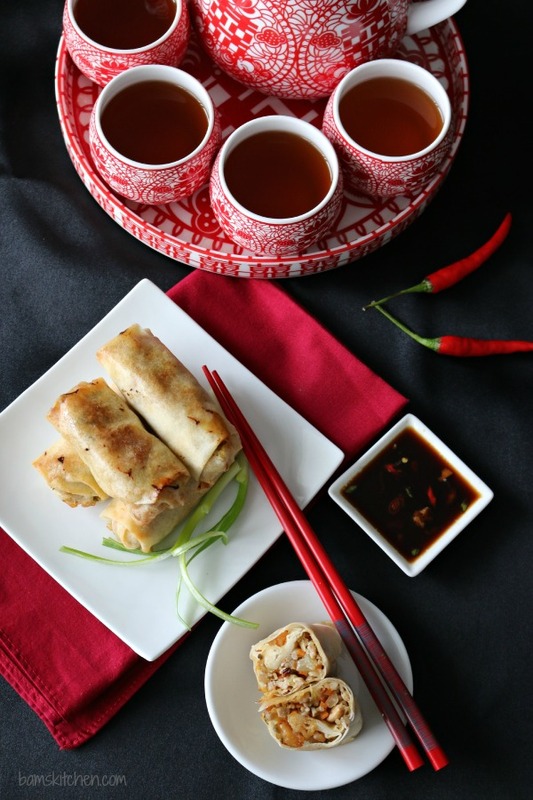 I chose to make my baked Chinese spring rolls with traditional ingredients but with untraditional alternatives to make it easy to create, even if you are not living in China. Even though I have access to all the ingredients I need here in Hong Kong, I made my spring rolls with standard run of the mill green cabbage instead of Napa (Chinese) cabbage. I even used sherry cooking wine instead of my favorite Shaoxing wine just to prove my point. The only item that is a must have is the spring roll wrapper. 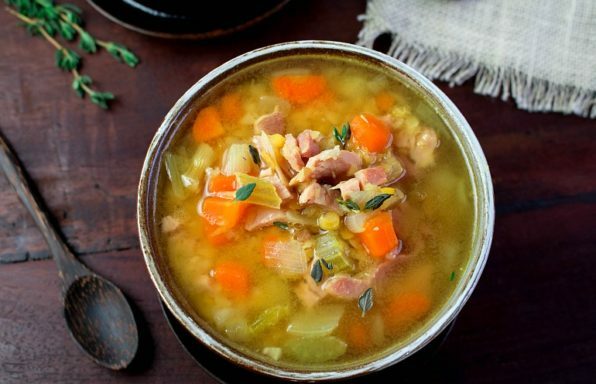 These can be found in the freezer section of your market. During my last visit to the States I found these in both Krogers and Meijers in the frozen food section. However, in other areas of the world you may have to visit an Asian Super market to get this item. I used Doll Spring Roll pastry wrappers that are made in Hong Kong. You need to store the spring roll wrappers in the freezer until you are ready to use. 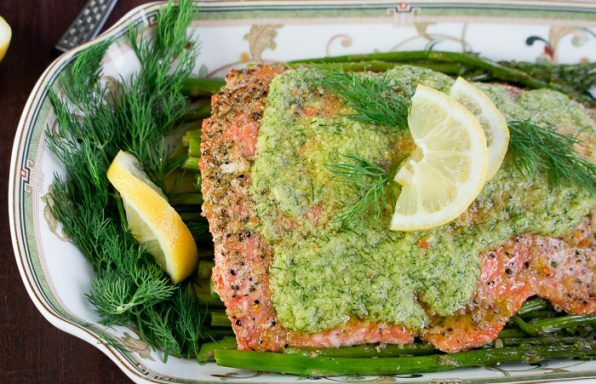 You can either thaw at room temperature for 30 minutes or in the refrigerator over 2 hours. It is super important that once you open up the spring roll wrappers, you need to cover the ones you are not using with a clean wet cloth to prevent the spring rolls from drying out. Trust me this step is very important. The beauty of this fun and delicious appetizer is that you can really make it with anything your heart desires. Open up your crisper and see what you have. Mushrooms, greens, onions, bamboo shoots, water chestnuts, carrots, bean sprouts or any little vegetable you like and have on hand will be delicious. 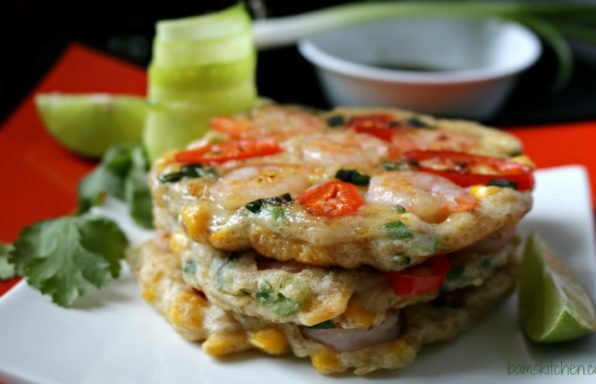 I chose to include both ground pork and shrimp as this is a traditional ingredient found in many dim sum treats. I love that little crunch of the shrimp and the savoury richness of the ground pork. However, you can make these baked Chinese spring rolls totally vegan if you wish with mushrooms with veggies as this makes a delightful mix of textures. I opted to skip the egg wash to hold them together and instead used a cornstarch and water slurry. It worked like a charm. I also skipped the egg in the actual mix and it was not even missed. The one main point that I cannot reinforce enough is that you must drain and remove as much of liquid moisture from the cooked filling as possible before putting it into the spring roll wrappers as this keeps your spring rolls crispy and delicious when baked. Rolling a spring rolls is quite easy. Think of it as rolling up a tortilla or maybe do you remember bringing home your newborn home from the hospital and wrapping them snug as a little bug so they slept through the night? This is the same concept. 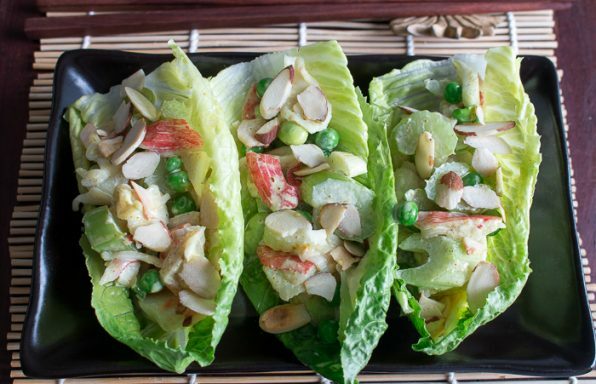 You want to wrap your little spring rolls tight so they do not come apart during the baking process and of course you get style points with all of your family and friends. Place the spring roll on a clean surface and face it towards you like a diamond. Paint in a layer of the cornstarch slurry around the edges of the spring roll. 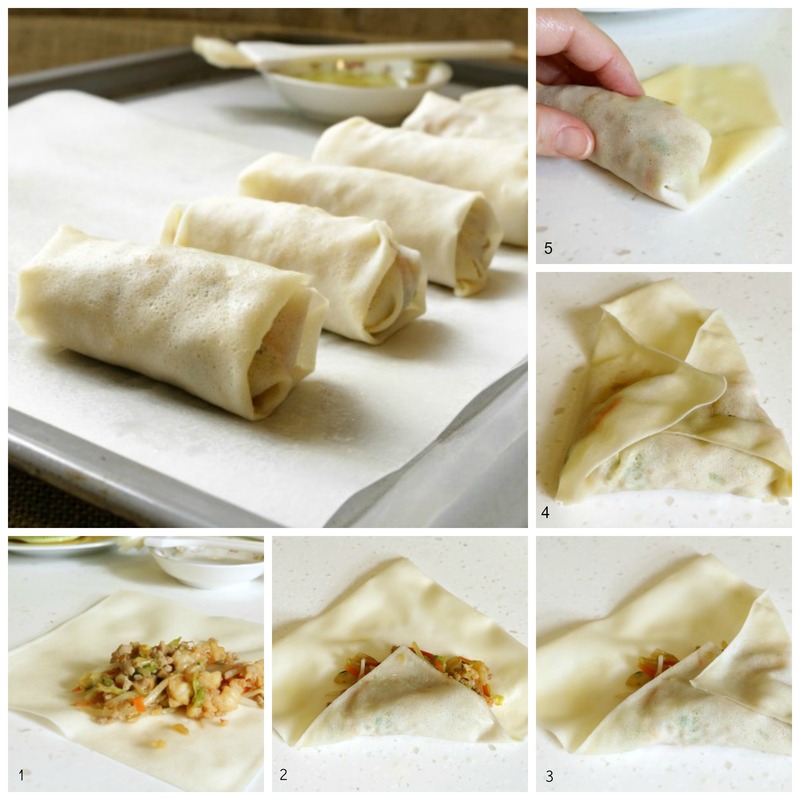 Place a heaping tablespoon of the delicious filling on the side and then fold over the edges and start to roll up. Make one last brush with the cornstarch slurry on the end and roll up. Now it is just as easy as that...! Just need to bake and eat! 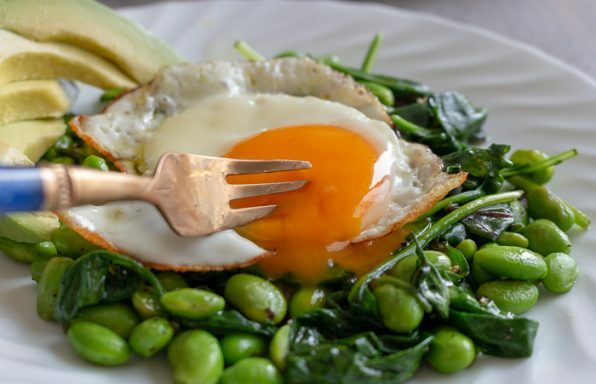 Have you ever wondered what the difference is between a spring roll and an egg roll? It is not the fillings, it is what the wrappers are made of. 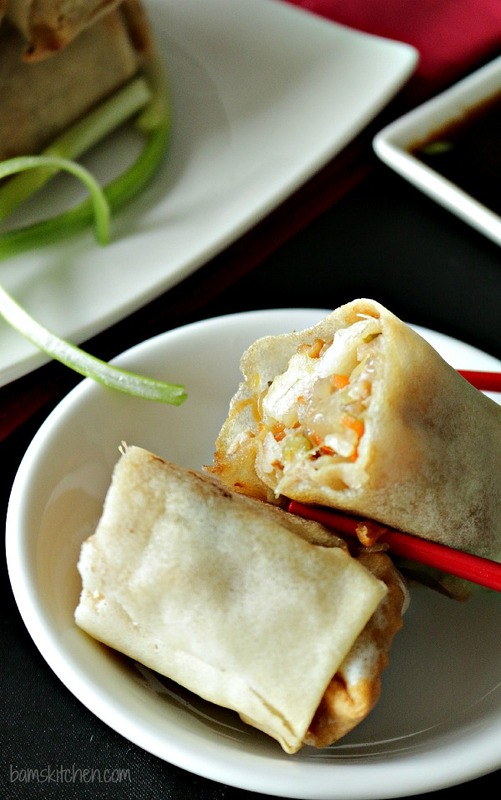 Spring roll wrappers are traditionally made with wheat flour, water, salt and oil. However, egg rolls actually have eggs in the ingredient list too. Traditionally, I have not seen egg rolls here in Hong Kong but we do have many different recipes for spring rolls here. 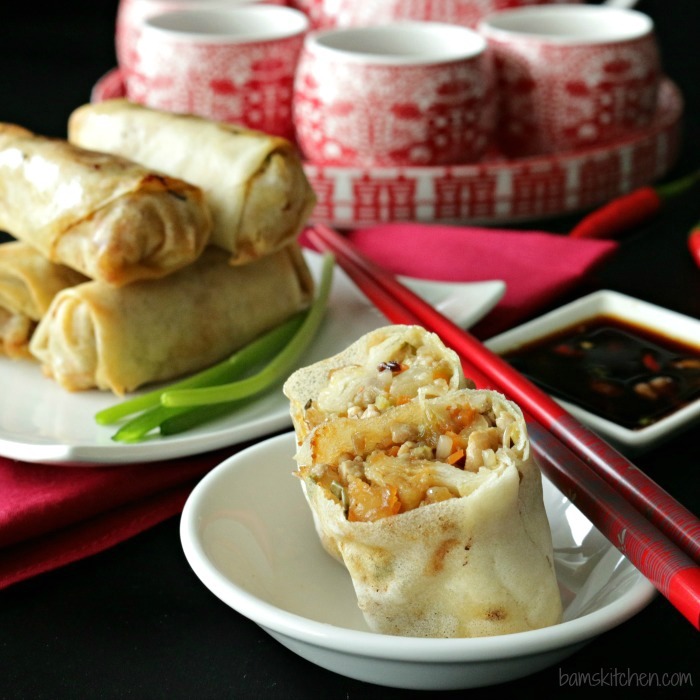 You can use either spring roll or egg roll wrappers in this recipe but the egg roll wrapper is a little thicker and the spring rolls are little lighter. My easy and simple zesty ginger tamari dipping sauce brings these Baked Chinese Spring rolls to a whole new level so I hope you will give it a try. Crispy and light spring roll wrappers filled with tender shrimp, pork, ginger, garlic, fresh herbs and spices and baked to perfection with a zangy ginger tamari dipping sauce. 1Take the spring roll wrappers out of the freezer and allow to come to room temperature for about 30 minutes or place in the refrigerator to unthaw for about 2 hours. Keep sealed and do not open package or otherwise they will dry out. 2In your wok/frying pan add 1 tablespoon of oil (reserve 1 tablespoon of oil for later to brush the spring rolls before baking) Add garlic and ginger until fry until aromatic (if you like it spicy add chili peppers). Add the pork and cook until no longer pink but not browned, about 3 minutes. Add cabbage , carrot, bean sprouts and/or any veggies you like and fry for a minute and then add the shrimp and cook just until pink. Add shoaxing wine (cooking sherry), tamari (soya sauce) to taste, white pepper, sesame oil and green onions and mix well. Drain in colander to remove the moisture and press down to remove the excess juice from the mixture. Set aside. 5Brush the spring rolls gently on both sides with a little canola oil. Bake seam side down for about 10 minutes. After the first 10 minutes turn the spring rolls over and brush on a little more oil and bake for an additional 10-15 minutes or until golden brown and crispy. 6Make the dipping sauce. In a small bowl add tamari (soya) sauce, sesame oil, garlic, ginger, green onion and if you like it hot a little chopped bird chili. Mix well and serve as a dipping sauce for spring rolls.